Azimut Yacht Cruise for 7 Days around Ios-Naxos-Paros-Mykonos. Sail with an Azimut Yacht! Start from Santorini Island aboard this 7 day Cruise and explore the Southern Cyclades islands of Ios, Naxos, Paros and Mykonos. 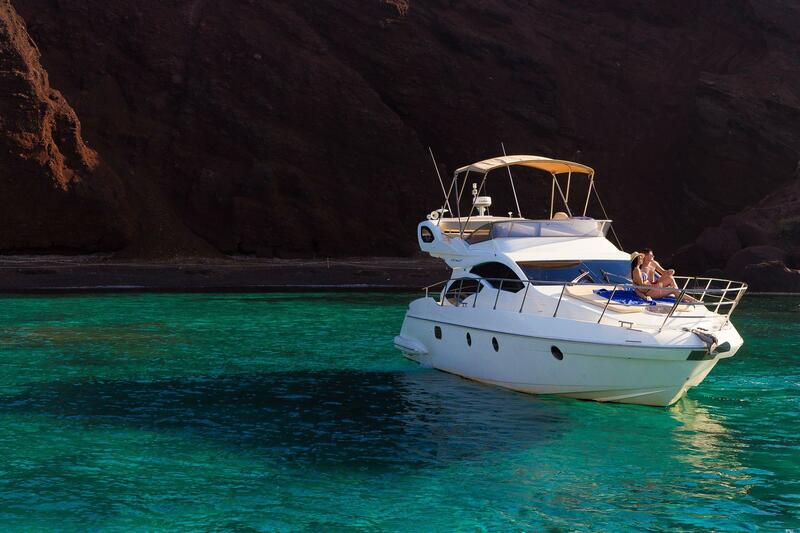 Your Azimut Yacht sailing experience starts from Santorini. Explore the island’s beauties and highlights. Sail to the Red and White beaches, the Caldera Coastline. Swim at the Hot Springs, sail past Oia and Thirassia island and visit all picturesque locations Santorini is famous for. Our Azimut Yacht Cruise continues to the island of Ios, where you have the opportunity to swim at Maganari among others. Most noteworthy, Malagani is an acclaimed beach of Ios, known for its crystal blue waters and golden sand. Furthermore, explore the island before we end the day in the port. Disembark and discover Ios’ nightlife. Additionally, walk its traditional alleys. Finally, see the traditional villages of Skaros and Palaiokastro and similarly the Archaeological Museum of Ios. Following our visit to Ios Island, we sail towards Naxos, an island of archaeological interest with many traditional villages and buildings alike. Discover intriguing local cheese production as well as the famous Naxian Marbles. Moreover, discover the sea environment of Naxos, a true cylcadic beauty. Finally, swim at Agios Prokopios Beach and walk through the nice alleys of the island. The third stop in this multi day Azimut Yacht Cruise is at the island of Paros. A Cycladic island known for its traditional windmills, its marble quarries and monasteries alike. Most noteworthy, they date back to the Middle Ages and made the island famous worldwide. Additionally, Naousa, a historical city, keeps Paros as a top destination in the Aegean Sea and the Mediterranean alike. Paros is a remarkable historic port of ancient world’s trade network, worth visiting overall. Moreover, Paros’s religious history dates back at the medieval ages with buildings that still stand well preserved. Our last stop with the Azimut Yacht will be the island of Mykonos. Most noteworthy, Mykonos is well known for its Cyclades architecture and its glamorous mykonian nightlife. Additionally, its traditional villages and charming alleys can be combined with local shopping. Finally, you can enjoy swimming at the best beaches of the island, Psarrou and Elia.